NOTICE: Activation key must be used on a valid Steam account, requires internet connection. ABOUT THE GAME	In the space of fifty years, Earth changed from a planet on cusp of a challenging future to a world a breath away from lifelessness and plunged into an apocalyptic time of ecological disaster, global warfare and the meltdown of human civilization. This is the time of the Maelstrom. … In this ravaged world, the planet's dwindling resources have divided what remains of mankind in two: the urban freedom fighting 'Remnants' and the technologically advanced 'Ascension'. Now they must wage war against a new threat, the invasion of a savage alien race, the Hai-Genti, and each other in a desperate struggle for supremacy and survival. Through the game's missions, take command from different viewpoints and employ faction-specific tactics and weaponry to achieve your objectives. 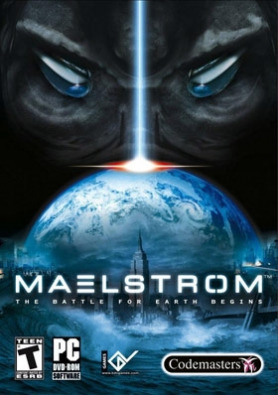 Complete with the ability to terraform landscapes and transform units, Maelstrom provides gamers with the power to harness the forces of nature in the most frantic, destructive, action-packed RTS game yet.KEY FEATURES A stunning mix of action-packed RTS missions set in a totally destructible and immaculately realised environment. A devastated future Earth becomes the battleground as a divided human race fights for survival against alien invaders. Through the game, players control each of the game's three factions - the Remnants, Ascension and the alien Hai-Genti - each with unique identities, strengths and tactics. Modify the terrain and use the elements as a strategic weapon. Create valleys, carve out lakes, freeze water, melt ice, create tornadoes and even control the wind. Characters grow experience and level up with new abilities as you progress through the game. SYSTEM REQUIREMENTS Minimum Requirements:OS: Windows XP Memory: 512 MB RAMProcessor: Pentium 4 2.4 GHz or Athlon XP 2400+Hard Drive: 4.5 GB available spaceGraphics: Supported 64Mb Graphics Card Sound: DirectX 9.0c-compliant sound card DirectX Version: DirectX 9.0c Supported Graphics Cards: ATi Radeon 9200, 9500, 9600, 9700, 9800, X700, X850, X1300, X1600, X1800, X1900, X1950 nVidia GeForce 4 (not MX), FX 5200, 5600, 5700, 5800, 5900, 5950, 6800, 7800, 7900, 7950 Not compatible with all integrated sound/graphics solutions (inc. Laptops). Recommended Requirements:OS: Windows XP Memory: 1 GB RAMProcessor: Pentium 4 at 3.0 GHz or Athlon XP 2800+ li>Hard Drive: 4.5 GB available spaceGraphics: GeForce 7800 or Radeon X1800 Sound: DirectX 9.0c-compliant sound card DirectX Version: DirectX 9.0c Supported Graphics Cards: ATi Radeon 9200, 9500, 9600, 9700, 9800, X700, X850, X1300, X1600, X1800, X1900, X1950 nVidia GeForce 4 (not MX), FX 5200, 5600, 5700, 5800, 5900, 5950, 6800, 7800, 7900, 7950 Not compatible with all integrated sound/graphics solutions (inc. Laptops).